OMEGA™ is pleased to announce the addition of NEMA size 23, 24 and 34 stepper motors with IP65 ratings for operation in severe environmental conditions. The OMHW series are dust proof and resistant to low pressure water jets, and are ideal for applications in wet factory environments such as the food and beverage industry or outdoor use. Key features include a nickel plated brass cable gland, sealed laminations, and front shaft contact seal. All models have an internal corrosion-resistant film coating as standard. IP65 specifies a product that is dust tight (no ingress of dust; complete protection against contact) and protected against water jets (water projected by a nozzle from any direction shall have no harmful effects). When setting the drive current, you should multiply the stepper motor's nameplate current by 1.2. This provides the correct conversion from the motor's full-step nameplate rating to the drive's current setting. If the motor nameplate current is specified as 5 Amps, set the drive current to 6 Amps (5 x 1.2) to achieve full performance. The OMHW stepper motors are 8-lead motors, offering the flexibility of either series or parallel connection. 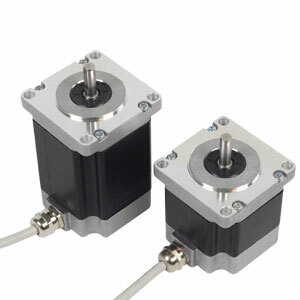 The motors should be series connected for best torque at low speeds, and parallel connected for best torque at higher speeds.